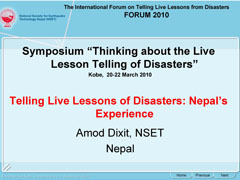 Exchanging opinions and outlooks to consider the role of Telling Live Lessons in disaster prevention and mitigation as well as further development of human society. 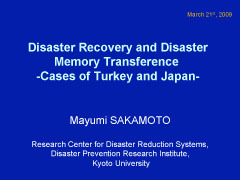 Associate Professor, Research Centre for Disaster Reduction Systems, DPRI, Kyoto University from 2005. His current research interests are disaster reduction planning, emergency management system, a long term recovery process, and crisis management. He received his B.E. in architecture in 1991 from the Kyoto University and his M.E. in architecture in 1994 from the Kyoto University. He received his Ph.D. in computer science in 1997 from the Kyoto University. Prior to joining DRS, he served as the Government Liaison with Fritz Institute in developing the Bay Area Disaster Preparedness Initiative, after 23 years of service with the California Governor's Office of Emergency Services (OES) where he had served as Manager for the California Integrated Seismic Network (CISN), Tsunami and Earthquake Programs and as Regional Administrator. As Coastal Region Administrator, he was responsible for the State's responses to disasters in the San Francisco Bay Region and north coast counties Prior to that appointment he served as the founding Director of the Bay Area Regional Earthquake Preparedness Project (BAREPP), a FEMA and state funded program, providing planning and technical assistance to promote and support earthquake preparedness and hazard mitigation by local governments and businesses throughout the San Francisco Bay Region. 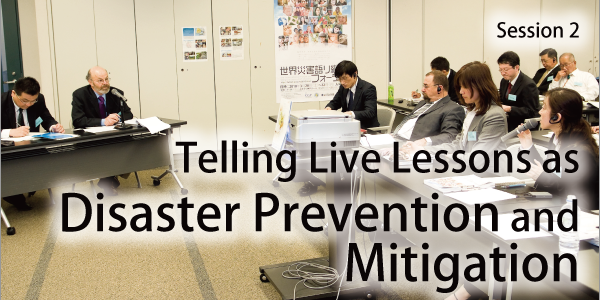 As a recognized expert in community preparedness, Eisner has presented papers on California's comprehensive approach to earthquake preparedness in the US, Japan, China, Kyrgystan and the Ukraine. 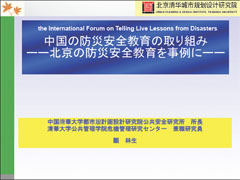 He has consulted on issues of hazard mitigation and emergency management including serving on the Global Assessment of Earthquake Countermeasures in Kobe, Japan (1999 and 2000), an international evaluation of the response to the 1995 Great Hanshin-Awaji Earthquake, sponsored by Hyogo Prefecture. From 1988 until 2003, he Chaired EERI's US -- Japan Urban Earthquake Hazard Mitigation Committee that organized collaborative workshops with the Japanese in 1991, 1995, 1998, 1999 and 2003. He also served as Co-Chair of the 1st International Conference on Urban Disaster Reduction convened in Kobe in 2005 on the 10th anniversary of the Hanshin-Awaji earthquake. Richard Eisner was elected in 1996 to the College of Fellows of the American Institute of Architects in recognition of his contribution to improving the quality of the built environment and to the architectural profession. He also served on the Board of Directors of the National Institute of Building Sciences, and the California Earthquake Safety Foundation. He currently serves on the Advisory Committee on Earthquake Hazards Reductions of the National Earthquake Hazards Reduction Program of FEMA, NIST, the USGS and NSF. He has also been recognized as the recipient of the Presidential Citation from the California Chapter of the American Institute of Architects, Lifetime Achievement Award from the Western States Seismic Policy Council, and the Special Recognition Award from the Earthquake Engineering Research Institute. 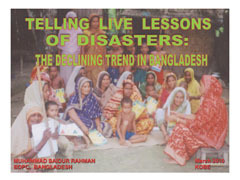 Bangladesh is one of the most disaster-prone countries in the world. Due to weak socio-economic and physical infrastructure, the impact of disaster is always high on the life and livelihood of the poor and the disadvantaged. The poor live in high disaster risk areas not by choice, but by compulsion as their socio-economic condition do not allow them to do otherwise. They risk their lives only to earn a subsistence living. They are exploited socially, economically and politically. So, the root cause of their vulnerabilities to disasters is not the exposure to hazards, but 'exploitation'. 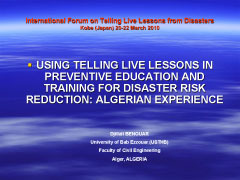 Living in disaster-prone areas for hundreds of years have taught the disaster vulnerable people indigenous coping strategies and survival techniques e.g. floating at the height of tidal surge during tropical cyclone with indigenous life jacket made of dry coconut; climbing tall trees and tying with tree trunks for protection from tidal surge; using rafts made of banana plants for evacuation, even living on it for days during the peak of the flood, etc. Lessons of these indigenous survival techniques passed through generations by various means e.g. telling live lessons through maternal hierarchy (from grandma to mother, to daughter, and the granddaughter). Live lessons were also kept alive through popular media such as folk lores, folk songs, open-air-stage performances, etc. These were done by committed and dedicated people who commanded respect and confidence of their fellow community members and villagers. However, the cyclone of 1970, that killed half a million people in Bangladesh, brought significant change in those practices. Dissemination of live lessons and family level preparedness, done mainly by the elders of the families and community leaders, were replaced by paid workers of NGOs, educational institutions, and government controlled media. Now a days, 'invasion by NGOs' (who are entirely dependent on foreign donors, except for a very few) is thrusting upon disaster vulnerable poor people ideas of coping with disasters in a 'top down' and 'donor-driven' way. Dust collecting glossy publications and profit making digital and electronic media are replacing the age old effective practices of 'telling live lessons'. All these are not only far from the traditional culture of the largely rural Bangladesh but also destroying the very cultural fabric of the society. Moreover these are devoid of commitment and dedication that we used to boast of in Bangladesh. Therefore, we need to go back to our traditional culture and age old practices of telling live lessons for effective disaster risk reduction of the poor. Mr. Dixit studied in St. Petersburg University and in the Asian Institute of Technology. He has a professional experience of more than 35 years including a 20-years stint with the government of Nepal, in private engineering consulting firm, and as a visiting professor of engineering geology. He founded NSET, a Nepal-based NGO focussed in earthquake risk management, in 1994, and has been serving as its Executive Director. He has been engaged in DRR project implementation in Nepal and other Asian countries. For the first time after a major earthquake in Iran, problems, comments and issues of affected people has been analyzed through a local newsletter. 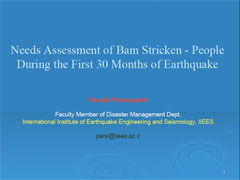 This paper will provide a brief description of needs of earthquake stricken people in Bam by reviewing the news values of different variables in a local newsletter within a period of two years. After the Bam earthquake on December 26 of 2003, the affected people needed a media in order to express their experiences, comments and difficulties and also to be aware of activities around them. For dissemination of information among the people many pamphlets and newsletters have been distributed in the city after an earthquake, but one newsletter has been published systematically for exchange of information in the region. In this article the news values of different issues and variable of this newsletter for a period of two years will be reviewed by content analysis. The museum was established within the premises of the headquarters of the civil protection in 2004 in the wake of the Boumerdes 2003 earthquake by the General Directorate of the Civil Protection. The Civil protection is responsible for administration and management of the museum. The museum for natural disasters is located within the national museum of the civil protection in Algiers. The visitors of the museum are mainly school children (about 1200 a year) and general public (about 250 people a year). The visit of the museum is a real education training session in terms of preventive education. The idea has been well appreciated by the general public as well as by school teachers and children. The civil protection called an artist to build models showing the situations during earthquakes, floods, forest fires, etc., including shelter, response and relief operations. Keeping the memory of the disasters and so people will not forget and should live with the risk. Trained members of the civil protection and mainly those members who participated in response and relief during disasters are the guides and operating the museum activity. About the main activities of the civil protection in peace time is conducting drill across the country about earthquakes, floods and fires. Unfortunately, people are not involved in museum activities. Naturally, some associations and universities are commemorating each year the most destructive disasters, by telling what and how it happened and particularly measures that have been implement to reduce the risk during future destructive events. Several conferences are held each year particularly in the zones affected by disasters where the general public is invited. Also, people in informal gathering, very often tell their stories about things that happened during disasters. In the cultural background of the society which a strong tradition anchored in their oral culture, people are used to tell their stories to their family members and in gathering occasions. I believe that beside the disaster scenes in the museum, the managers should also show the reconstruction in all its aspects as social, economical, cultural and physical. They should promote the development of the human society within a risk environment as northern Algeria. This type of museum is planned to be developed and multiplied in other cities across the country. 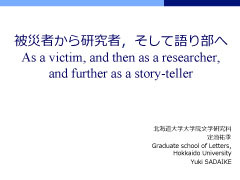 Research Assistant at Research Center for Disaster Reduction Systems, Disaster Prevention Research Institute, Kyoto University; Lecturer on International Cooperation Studies at Kyoto Sangyou University; Special Assistant for Embassy of Japan in El Salvador(1994-1997); Staff of Japan International Cooperation Agency(1997-2007). Main fields are International Cooperation Studies and Disaster Recovery Studies. I am a researcher who experienced disaster as a junior high school student. In providing lessons and presentations on my research work, I realized that what people want to hear and how they react to what they hear differs greatly according to age, occupation, where they live, etc. I will be reporting on an effective method of audience-tailored “storytelling” I use in research and outreach activities, from the perspective a researcher, storyteller and reporter. I am a born and bred native of Hokkaido. I became interested in researching disasters after going through the Hokkaido Nansei Oki Earthquake that covered Okushiri Island in a tsunami on July 12, 1993. My specialty is regional sociology and the study of impacts of natural disasters on society. While developing fieldwork on Okushiri Island and in the area surrounding Mt. Usu, I am actively giving lessons and presentations that weave together my own personal experience with disaster and my research results.